Without recognizing the misconceptions that can result from the mind playing tricks, the chance for unethical, wrong decisions grows. "Sometimes we make irrational decisions," William Wilhelm of Indiana State University's Scott College of Business said Wednesday during the college's ninth annual Ethics Conference. "Sometimes we make cognitive errors that throw a curtain over our rational decision-making process and how we perceive and think about things." Wilhelm, professor of business education, information and technology, explained that there are two means of making decisions - intuitive and fast, or methodical and analytical. He demonstrated how quick thinking can lead to wrong outcomes by pulling up a picture of two lines, which, at first glance, appeared to be the same length. 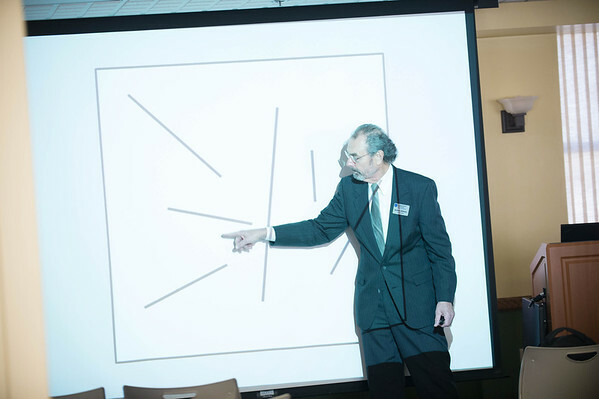 "What your perception tells you that the line on the left side looks longer, but it's not," he said. "It's our perception that throws you off, so you have to shift to your analytical thinking side to figure out that the lines are the same length. It's the mind playing tricks on us, so we have to slow down and use analytical thinking to base decisions off of hard facts, not presumptions." History is full of examples of humans creating their own narratives based on fallacies that lead to unwanted outcomes, Wilhelm said. He cited the claims of weapons of mass destruction then-U.S. Secretary of State Colin Powell made to the United Nations as justification for entering war with Iraq in 2003 as a recent example. But unwanted outcomes can be avoided, Wilhelm said, through awareness of blind spots and cognitive errors and asking one's self, "Is this decision important?" "If it's something frivolous that really doesn't matter, make a quick decision," Wilhelm said. "But if it's a significant outcome, then you have to shift from your intuitive side to the more analytical side of thinking. When you ask that question - is this decision important? - it lifts the curtain of cognitive errors because you are aware of it now and more inclined to follow a more step-by-step approach to decision-making. "If we are aware of blind spots and cognitive errors and remember to ask ourselves if each decision is important, we have a tendency to concentrate on analytical thinking. It's not that intuitive thinking is wrong, but it can get us into problems."